So, this is it. Day 1 in Mexico. I headed out about 7 am and by 7:15 I was queued up and ready to cross the border. On my first trip through, which admittedly, did seem all too easy, I got all the way to the interior checkpoint (about 50 km inland) before discovering that I needed a vehicle permit. I knew that I would need a permit in most countries but as I crossed the border at Laredo it seemed like all they wanted was for me to keep moving, so that’s what I did. So I ticked off an hour lost as I turned around and headed back to the border to get the required vehicle permit. 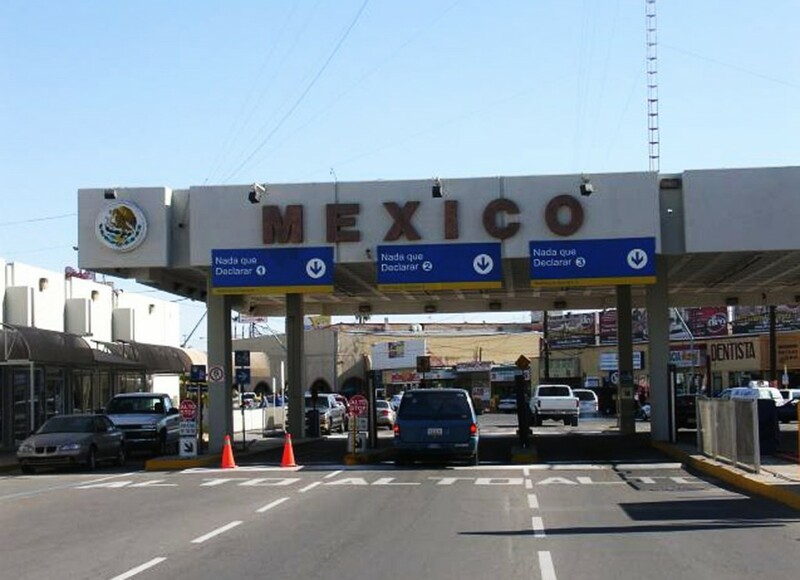 The US/Mexico border crossing works like a cattle pen; once you get in, you can’t get out. So when I got back to the border and couldn’t spot a vehicle permit office, I ended up crossing all the way back into the US. Mom would have been happy if I had called it quits right there and just kept on driving north. It took two more runs back and forth across the border before I finally broke out and spotted a Policia Federal to ask for help finding the permit office. The Policia gave me the directions I needed and then promptly asked for a tip. That’s was when I realized that my wallet was missing. I frantically searched the car, and, anxious to move on, was just about to pull away thinking it was probably just buried under all the stuff in the passenger seat when I thought to check outside the car. And there it was. It had fallen out of my lap when I jumped out to ask for directions. I had about $250 folded lose in my wallet and quickly realized that it had all blown away down the highway. I quickly found $20 and the Policia joined in to help me look for the rest. After a few minutes, I found another $50 but unfortunately that was all that I could find. A real blow but hey, at least I had my wallet. I arrived at the permit office and got my vehicle permit without much trouble. I detoured around the insurance sales vendors thinking a) I was in a hurry; b) Geico had my back; c) they would tell me at the permit window if I needed the coverage, and; d) I had just literally thrown about $150 to the wind. They didn’t ask, so I didn’t buy. I was bolstered by a certain sense of pride as I smoothed out my Mexican auto permit on the windshield; I was now officially ready to start my trek across Mexico. 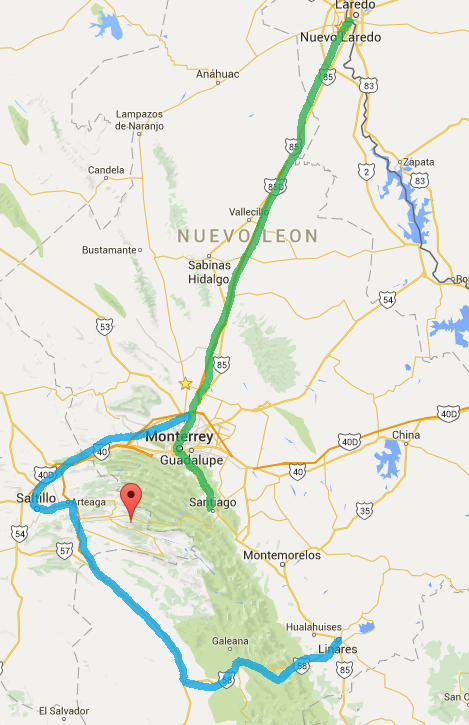 I had set my GPS for a small town called Santiago, safely located 100 km south of Monterrey. Hemingway was the consummate ex-pat so Santiago seemed to be a fitting destination. The border area in Nuevo Laredo is a cesspool. 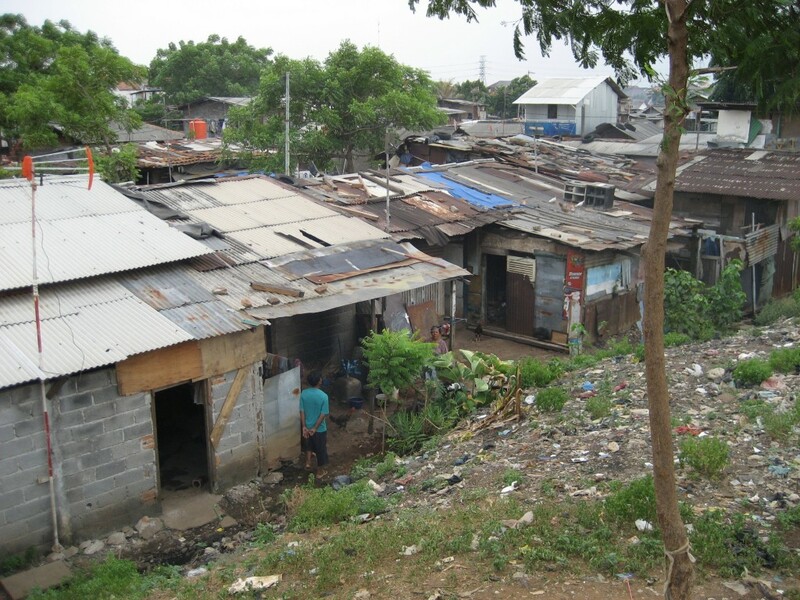 Every stereotypical image of Mexican squalor was there on full display. I just wanted to find my way back to the highway and finally get underway. I made my way back to highway 85 out of Nuevo Laredo headed south. If you look at the map, highway 85 goes straight through Monterrey and directly on to my planned destination, Santiago. But I wasn’t looking at the map. I was relying on my GPS and when I approached Monterrey it took me west. I knew I was supposed to pass through Monterrey so after driving on for nearly an hour I realized that the road signs I was seeing for Monterrey were all pointing back to the east. That’s when I also realized that my GPS was showing my estimated arrival in Santiago for 6:30 am the next day. Something was clearly wrong. I pulled over and reset my GPS for Monterrey which meant I need to turn around and head back in the opposite direction. 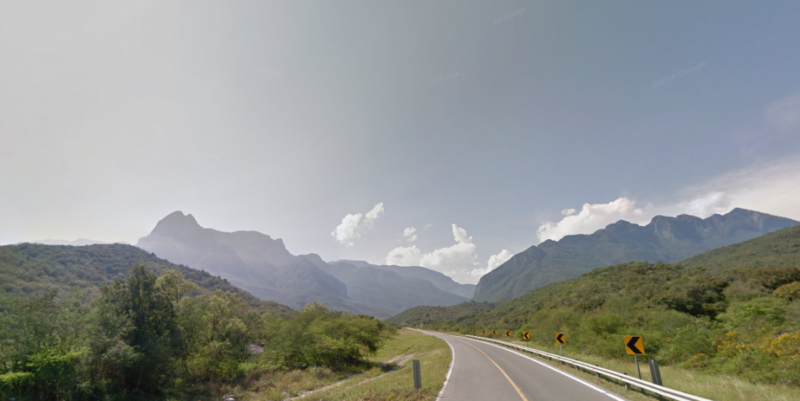 But I was on the access-controlled, divided, highway 400 going across the northern edge of the Sierra Madre Oriental mountains through the Parque Nacional Cumbres de Monterrey so I had to continue driving west; torturously knowing that I really needed be going in the opposite direction. I had one chance to get off and turn around. And I missed it. I eventually ended up in Saltillo, almost 2 hours away from Monterrey, three hours from my destination of Santiago . I drove around and around in Saltillo searching for a road sign pointing the way back to Monterrey and eventually spotted one on the other side of the highway. I hastily looked for a “ returno” that would allow me to make the u-turn to head back in other direction. As I was making my second “returno,” a Policia Federal drove past and pointed at me. I made my turn and there he was, flagging me over. I had read on a travel blog where some other cross-country trekkers had recounted some shady sounding tricks to get Mexican plates for their car in order to avoid conspicuously self-identifying themselves as foreigners while on the road. I had dismissed the idea of driving aound with illegitimate plates as being even more risky – I was now about to have second thoughts. The Policia Federal said I had run a red light and then promptly asked for proof of my Mexican auto insurance. When I explained to him that I didn’t purchase the Mexican insurance coverage he advised me that he would have to tow my car and put me in jail for the night until I could appear before a judge the next day to answer the ticket. He wasn’t buying my Geico explanation but he did “kindly offer” to let me pay him right there on the spot and avoid all that trauma. Then he advised me that the fine would be 8000 pesos (roughly$450)! In what I later learned was characteristic Mexican Policia hospitality, he offered to take me to the ATM to withdraw the necessary money. I told him that I didn’t have that amount of money in my account and that I would have to have it wired. After some more back and forth haggling he finally agreed to take $200 US plus the 40 pesos and roughly $18 in loose bills that I had in my wallet. I retrieved my $200 emergency stash from its hiding place in the back of the car and handed over all the loose bills in my wallet. Then he and his co-conspirator happily shook my hand and guided me out to Highway 57 heading east. 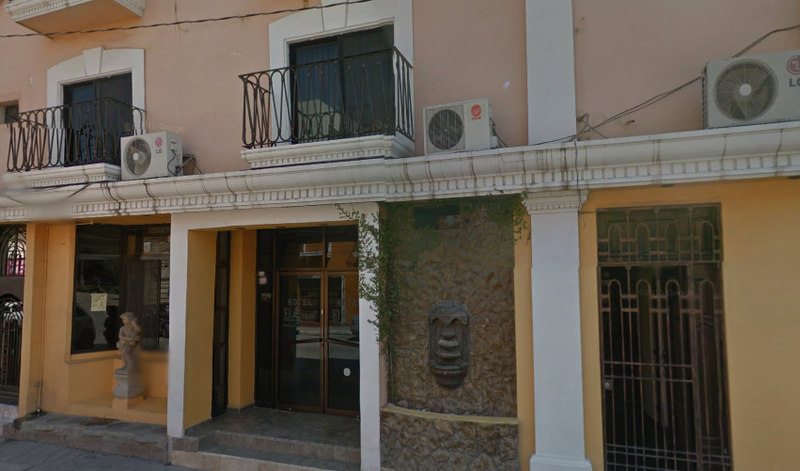 I realized later that the stop lights in Mexico are in really odd places – often atop a post on the curb side of the road – so it’s entirely possible that I did run the red light and that the fine for that, plus not having the insurance, was, in fact, $8000 pesos. Still, even if he was actually doing me a favor by accepting the $200, that, coupled with the cash I lost at the border crossing, put my day’s losses at close to a very painful $400. At that point, I went into what I’d call gorilla travel mode and just tried to put all of the missteps out of mind and concentrate on getting to my destination. I drove and drove and drove and just couldn’t make sense of my GPS routing compared to the road signs I was seeing. I finally stopped and bought a Mexican road atlas for $210 pesos. I located my position on the atlas and that’s when I realized my error. Mexico is made up of 31 states and there is a strong likelihood that every one of them has a town called “Santiago”. I never did figure out which Santiago Garmin had randomly picked out for me but it clearly wasn’t the one in Nuevo Leon. I drove on east on highway 57 and then followed it as it turned south on a path down the western side of the Sierra Madre Occidental mountain range, just hoping I would just stumble across some place to spend the night. By sundown, I realized that wasn’t going to happen so I went back to the atlas and found the closest town directly to the east, Linares, about 40 kilometers away. My GPS showed a highway 31 coming up soon that would take me east, across the mountains, to Linares. Forty kilometers should be about an hours drive which seemed tolerable, even though it meant breaking one of my rules about not driving after dark in northern Mexico. Shortly after turning east onto Highway 31, I encountered my first “desviacion” warning. The highway was being rebuilt and when the main road is nothing more than unrolled asphalt, a “desviacion” means they took a road grader, ran it through a field and that’s the new route. I honestly thought the word meant destruction zone until I looked it up later and learned that it means deviation. These deviations felt like driving on a cobblestone street only worse because they were actually just dry, dusty, dirt. Top speed was about 5 to maybe 10 miles an hour. I must have gone through 20 of these “deviations,” including one that involved crossing a creek, slowly and cautiously crawling my way across the mountains, trying, and hoping, to evenutally make it to Linares. I finally arrived about 11:30 pm. To my relief, Linares was a beautiful, and more importantly, peaceful, little town. A small, time-worn city with friendly Policia on every corner. I found a hotel for $28 with a nice room and good hot water. I had to park about 2 blocks away but the lot had a night watchman who even helped me carry my luggage back to the hotel. Between my reluctance to stop anywhere in the northern zone and my anxiety about being lost most of the day, I had only eaten a few slices of bologna from the cooler in my car but, at that point, I was too exhausted to eat. I tossed my luggage on the floor and with a somewhat tentative sense of relief, fell into bed for my first night’s sleep in Mexico. Planned versus actual route first day in Mexico. 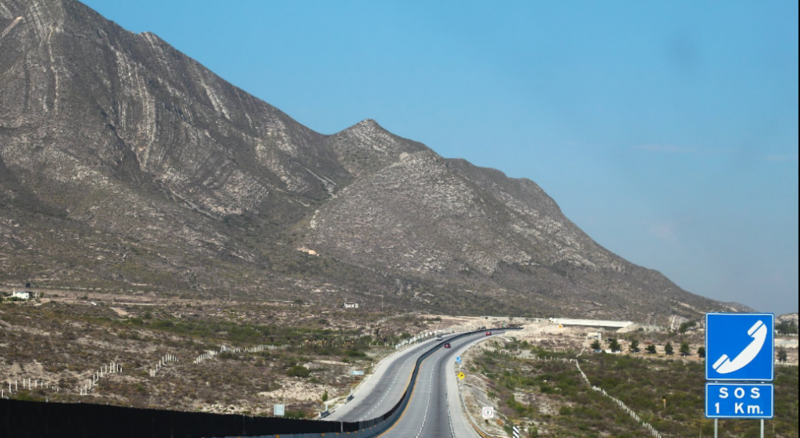 The green route from Laredo through Monterrey to Santiago was the planned route. The blue route is where I ended up.